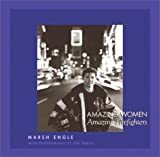 This little book (79 pages) features black and white photographs of female firefighters accompanied by their own words, or poems, or short descriptions of the women. So many of the images of the firefighters rushing into the World Trade Center towers or picking through the rubble after they collapsed are of men, and that's not surprising since fewer than thirty women serve among the nearly 12,000 firefighters in New York. But there are women in FDNY, and their contributions are worth noting. The pictures show the women, at work or at home, along with other image of fire trucks, fire hoses, and fire helmets. The text conveys some of the women's feelings about the loss of their fellow firefighters on September 11, 2001, and also makes clear their contribution on that day. This book is nicely produced, and may be especially appreciated by people who have personal connections with firefighters.